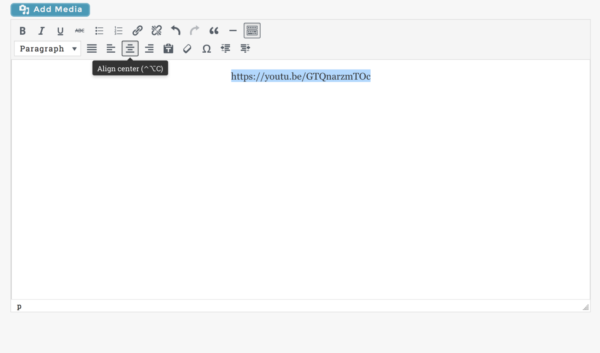 Videos hosted by YouTube and Vimeo can be embedded in a post or comment by pasting the URL onto a new line by itself. Make sure the URL is on its own line (i.e. not proceeded by anything, even a space). will not produce the desired results. 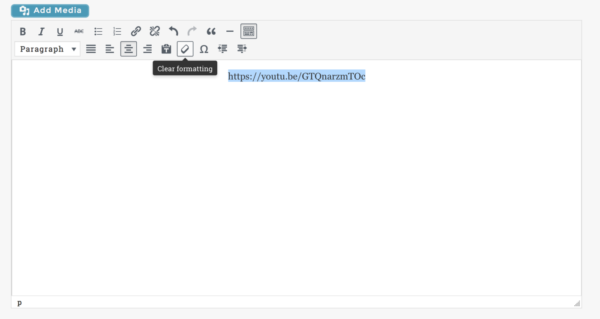 If the url (https://youtu.be/GTQnarzmTOc) on a new line by itself doesn’t embed properly, it may because there’s an html element proceeding it on the line (which you won’t be able to see). Reasons for there being an html element preceding the url might include: you composed your post in Word or another text editor then pasted it into Ricochet (word processing apps notoriously insert copious amounts of html elements), or you used the formatting bar to align the text you’re composing on Ricochet. For instance, if you center-aligned the url. The <p> paragraph element is interfering with the site’s ability to recognize the YouTube URL as a YouTube URL. to <p style="text-align: left;">, and won’t fix the problem. If that doesn’t work, then you can always email support. You can then save your post as a draft and we’ll be able to go in and edit it from our end.